The City Council is scheduled today * to vote on a proposal to declare the Lento Brick Court on Sunset Boulevard a historic-cultural monument. 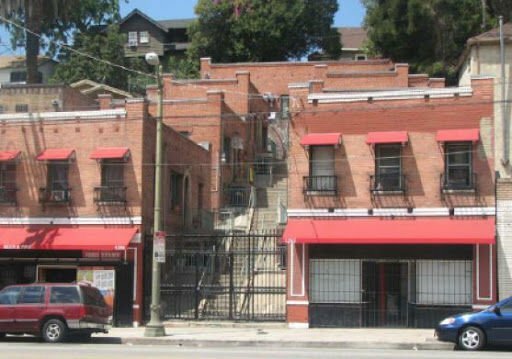 The 1928 complex built by an Italian immigrant and hat maker was nominated by the Echo Park Historical Society (The Eastsider is a board member) as a “rare example of a mixed use complex of commercial store fronts and a residential hillside bungalow court.” The Lento Brick Court, located in the 1200 block of Sunset Boulevard, is one of several hillside bungalow courts found on both sides of Sunset Boulevard between Elysian Park Avenue and Marion Street. This type of courtyard housing was popular among builders and residents during the early part of the 20th Century. In Echo Park, the builders of these bungalows courts adapted their developments to the hilly terrain, creating terraces of tiny homes that climbed the steep hills. * Update: The City Council voted in favor of the declaring the Lento Brick Court a historic cultural monument.